What is precision attachment partial denture (Precision and semi precision partial dentures)? It is a kind of denture which is applied when there is loss of many teeth and treatment with total dentures is not possible. They are colloquially known as “dentures with snap fasteners” because of their hidden fasteners which seat in their slots prepared on teeth. How long does precision attachment partial dentures production take? How many times should I come to visits? Precision attachment denture preparation phases are the same as partial denture’s. Precision attachment dentures are prepared approximately after 5 sessions including measurements and various trials. Approximately 2 weeks is sufficient for 5 sessions. Are precision attachment partial dentures easy to use? There are fragile fasteners which seat in their slots in precision attachment dentures. Although they are so tight to wear and take off when they are first produced, they are worn and taken off easily over time. They must be carefully used. Will I get used to precision attachment partial denture? This kind of dentures has metal parts under the tongue on the lower jaw and across the upper palate on the upper jaw as in partial dentures. These parts make getting used to the dentures hard at first. However, patients use them as if they were their natural teeth after a certain time. How should I clean precision attachment partial denture? Cleaning of the precision attachment dentures is the same as that of partial dentures. Because precision attachment dentures are made by getting support from both the soft tissues and existing teeth, coherence problems do not occur. Cutting, biting and grinding functions are done comfortably. Hidden fasteners of precision attachment dentures, which seat in their slots prepared on teeth, prevent their movement. Hence, they do not move while eating. Loosening may be observed in rubbers of the hidden fasteners. In this case, movement of the dentures is easily eliminated by changing the rubbers. Because fasteners of the precision attachment dentures which get support from the teeth are hidden in the denture, they have a more esthetic look than partial dentures. What should I pay attention to while using precision attachment partial dentures? In addition to what should be done while using total dentures, you should do no harm to fasteners when placing them and taking them off. These processes must be done carefully and slowly. You should close your jaw after you are sure that they fit. You should not try to place them while the jaws are closed. Otherwise, fasteners may bend and get broken. Are precision attachment partial denture repairable when they are broken or teeth fall off? As in partial dentures, the base and the teeth of precision attachment dentures can be repaired easily. If fasteners loose they can be changed easily but if fasteners are broken they cannot be repaired easily. How long does repair process take? As in partial dentures, depending on the shape and size of the fracture, it is possible within 1-2 days to repair them. As for partial dentures, precision attachment dentures can be applied to almost every patient. They can be applied easily to diabetics. Bruises and wounds after application may take a long time to heal. Also, because dry mouth may occur, special gels and artificial saliva products may be necessary. In precision attachment dentures, bone tissue volume is not that important. Because it is a denture which is made considering the support of the teeth, the number, the strength and the sizes of the teeth are important. First of all, allergy tests must be done to detect allergic substances. Metals and acrylic materials are used in precision attachment dentures. If patient is allergic to metals, those metals are found by tests and another metal is used for the preparation of the dentures. However, if patient is allergic to acrylic which is a component of total dentures, it is not possible for them to use dental ventures. In such cases, implant supported fixed partial dentures can be used. Precision attachment dentures can be used for a very long times if they are provided with proper care and hygiene. Rubbers of fasteners or other parts may loosen or get broken over time. If there is loss of the teeth which give support to the dentures, the denture must be renewed. Are applications performed on existing teeth while precision attachment dentures are prepared? Because precision attachment dentures must seat in the slots, existing teeth must be crowned. What are the differences between partial dentures and precision attachment dentures? 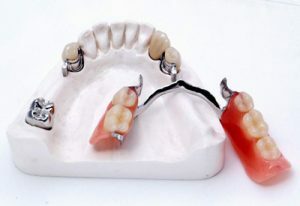 There are clasps in partial dentures which are not esthetic but there are no clasps in precision attachment dentures. Any application may be unnecessary for existing teeth in partial dentures but applications are necessary for existing teeth in precision attachment dentures. 4-6 teeth are required for precision attachment dentures but there is no tooth limit for partial dentures. Precision attachment dentures are slightly more expensive than partial dentures. Are precision attachment dentures or partial dentures healthier? When tooth loss is in great numbers and when it is not possible to apply fixed denture, either removable dentures (partial and precision attachment dentures) can be applied or implants can be placed into jaw bone. Partial dentures cause physical damage on teeth and they may cause corrosion in jaw bone. For this reason, when tooth loss is in great numbers, implant supported fixed dentures are the healthiest treatment alternative.